Please excuse my delay in getting the 2006 trip report out to you. I was hopingthat the 3 college students, who we were fortunate enough to have accompany us this year, would be able to participate in the writing, but their busy schedules haven't allowed that to happen. Our trip started out on a sad note as my friend Toby, from Spokane, learned her mother had terminal cancer the day her tickets arrived, so she was unable to go. Two weeks before the trip my brother-in-law, Ross, from New Zealand fell off his roof and injured both ankles and legs. However, I did have incredible participants in Ann Smith, her daughter Marie, and two college friends of Marie, Matt and Dan, all from Boston. This was our third trip and the people were waiting for us! Everyday we had teachers or parents coming to find us, on the street, at the hotel, etc. It still amazes, and humbles me that they so value the supplies that we provide. We also get such wonderful and loving support from the whole Wilson family and the many friends of Becky and Mendel. Without them it would be impossible to do this work. Every morning we load up the van with the boxes of teacher's materials, supplies for the kids, and head to the oven to buy fresh bread (500 pieces). Next we head out and I have no idea where we are going. They tell me which schools we are going to visit that day, some as far as three hours up the mountain. Miraculously we find the schools and they seem to know we are coming. I still don't know how it all happens. In several schools the parents had gathered to thank us for our gifts. The children sing or dance, and the parents and teachers serve a soft drink, some potatoes, or crackers. Sometimes they present us with homemade presents. These people who have so little share what they have with such dignity and pride it makes my heart ache. This year we gave a box of supplies to each teacher, instead of one to each school. We were hoping that this would eliminate any competition. Also, we recognize that they each desperately need these things, as they often have to buy supplies out of their own meager salaries. We include such items as scissors, glue, rulers, masking tape, 3 kinds of paper, magic markers, colored pencils, pens, story books, puzzles, clay, soap, towel, etc. Of course, the most popular items with the children are still the volley and soccer balls. It still is the only thing they have to play with. 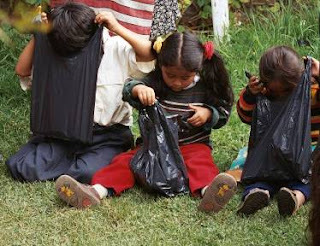 Each child receives a plastic bag with notebooks, pencils, erasers and sharpeners. I still can't believe how excited they are to receive these simple things. This trip we gave to 3,250 children and gave supplies to teachers in 78 different places . In addition, we were able to buy cooking pots and plastic cups for several schools so the teachers and parents can cook something for the children with the few commodities the government provides. Often the families send a few potatoes or yucca to augment what they prepare. One of the preschools had been given a fairly nice building, but there wasn't a thing in it. We contracted with a local carpenter to build desks and chairs, painted in bright colors. We were also able to assist a nun who makes a noon meal for about 120 kids, without any government or agency support, by buying some large quantities of food. 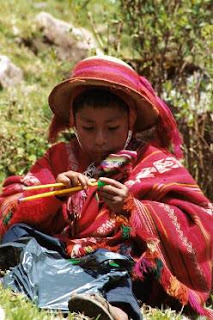 In one remote village the teacher is working to keep the young people participating in their cultural traditions by having the girls knit and the boys play the traditional musical instruments. We were able to assist in this effort by purchasing enough yarn and instruments for the school year. As always there were some very touching things that happened. One that moved me deeply was when a man approached me and told me that his son had chosen Becky for his godmother. They had waited for my arrival to ask if I would consent to be the godmother in her place. The young boy came to meet me, and I guess I passed as we are scheduled for the big celebration next year. A woman who we buy many supplies from in the market, and who has been very supportive of our work, also asked if I would be the godmother to her only son. When I consented, she also asked if my sister would sponsor her at church so she and the boy's father could get married. We are going to be part of in some meaningful celebrations next year! We are happy to announce that we have been granted tax-free status, thanks to the hard work of Angela Larson. Michael Prichard is the President of our Board, Alex the Vice-President, Jessica Cannon the Secretary, and I am the Treasurer, but Frank does all the work of keeping us fiscally compliant. The real force behind this project is all of you who make it happen with your incredible generosity!!!! There are thousands of desperately poor children and parents who thank you with humble gratitude. 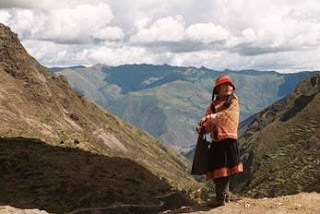 "The teachers we met were some of the most dedicated I have ever known"
"In nearly every political conversation I heard it was mentioned that the Quechuas were being manipulated by politicians. Promises would be made for better living conditions and more prosperity, vague assurances that are rarely followed through on. Education gains a whole new level of importance within this context"
"The gratitude of the children surprised me at each school. At one school there was no teacher, because she had a meeting. Still, the children waited for us most of the day, and when we arrived they sang for us, and a couple of them gave speeches on the school's behalf. These were words of appreciation from children who couldn't have been more that 12 years old"
"I saw poverty in these villages, but I did not see much despair"
"Dan remarked that through this experience he felt like he had gotten to know Becky, and I (Matt) felt the same way. Neither of us had known her, but after spending as little time as two weeks with people who had, I did start to get a sense of what kind of person she was. Her family and her friends had taken a tragic event and built something positive out of it. For her death to inspire others in that way gave me an impression of who she was"